UNDATED - For the week ending Sunday, fall harvest progressed on dry, warm weather. Strong, southerly winds ushered in above average temperatures across most of the State. The warm weather, combined with little to no precipitation, allowed significant advancement in soybean harvest. Fall tillage, fertilizer applications, and cover crop seeding were also ongoing in some areas. There were 6.3 days suitable for fieldwork. Topsoil moisture supplies rated 14 percent very short, 21 short, 63 adequate, and 2 surplus. Subsoil moisture supplies rated 23 percent very short, 26 short, 50 adequate, and 1 surplus. Corn condition rated 9 percent very poor, 15 poor, 31 fair, 37 good, and 8 excellent. Corn mature was 95 percent, behind 100 last year, and near 98 for the five-year average. Harvested was 19 percent, well behind 45 last year and 51 average. Soybeans harvested was 81 percent, behind 86 last year and 90 average. Winter wheat condition rated 30 percent very poor, 16 poor, 36 fair, 18 good, and 0 excellent. Winter wheat planted was 96 percent, near 99 last year and 94 average. Emerged was 80 percent, near 79 last year, and ahead of 61 average. 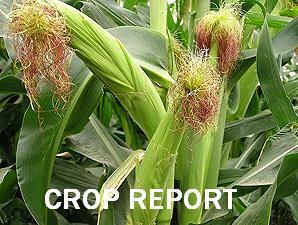 Sorghum condition rated 14 percent very poor, 19 poor, 48 fair, 19 good, and 0 excellent. Sorghum mature was 76 percent, well behind 99 last year, and behind 95 average. Harvested was 21 percent, well behind 78 last year and 63 average. Sunflower condition rated 3 percent very poor, 20 poor, 46 fair, 26 good, and 5 excellent. Sunflower bracts turning brown was 95 percent, near 91 last year. Harvested was 32 percent, well behind 54 last year, and behind 43 average. Pasture and range condition rated 29 percent very poor, 23 poor, 25 fair, 23 good, and 0 excellent. Stock water supplies rated 20 percent very short, 26 short, 53 adequate, and 1 surplus.